Before getting into things I'd like to thank the guy who forwarded Appendix B of the Horde Of The Dragon Queen PDF to me - you know who you are and you have my thanks. The 5 monsters in it have been entered into my spreadsheets and these all fit analysis to date. The highest CR of these was a CR4 Dragonborn NPC. D&D 5e monsters rely heavily on their Ability Scores to implement much of their mechanics. Once we have determined these we are in a position to compute dependant stats, like Hit Points. After considering these two aspects of D&D 5e monsters we'll apply the results to our Example Monster. I spent some time analysing monster ability scores. I looked at standard arrays. I looked at some point-buy approaches. And I looked at combinations of the two. I also tried to factor in possible racial bonuses. Now it's quite possible a combination of these approaches is being used, but if they are it's something not evident to me. What is apparent is that monster ability scores adhere to an average based approach, at least for the data available at the time of writing. Dropping a trendline on a scatter graph of each creature's maximum and average ability score produces some interesting results. We can see that the two are generally an equal distance apart. That said, the predominance of the very low level monsters does skew the trendline. 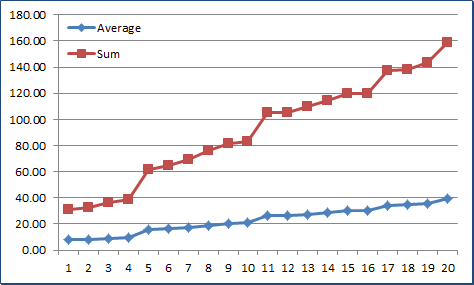 If we do some aggregation on the data we can work out both the average maximum attribute score and the average attribute score for creatures at each CR. 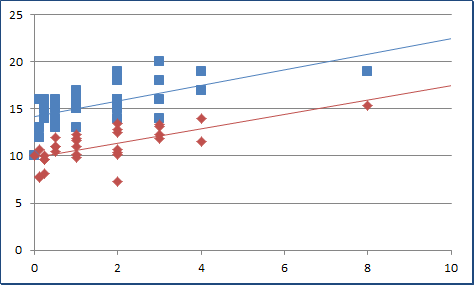 We can then create a scatter graph of this data and plot trendlines on the two sets of data. This shows us that average ability score remains pretty consistent and that the relationship between it and average maximum ability score is also normally fairly consistent. There is a little skew due to the Young Green Dragon, but that creature has sacrifices it's high score a little in order to improve some of it's secondary scores. 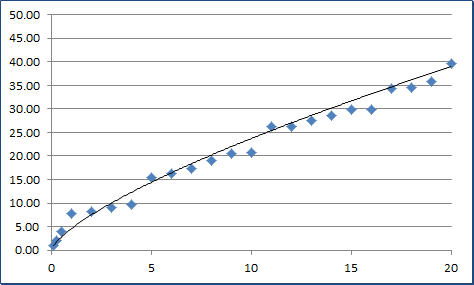 This data makes it pretty simple to construct a linear progression out to level 10 that we can be quite confident of. We focus on the CR1 through CR10 creatures for matching the curve and identifying the appropriate formula. For creatures lower than CR1 I simply entered data matching the analysis. I could have built a poly2 or poly3 formula to produce the same results. But I figure people following this series would rather me not waste several hours, possibly delaying the next post by an extra day as a result. Our analysis of the data tell us that the maximum attribute value is typically five higher than the average attribute value for the CR, but sometimes they are seven or even more. That's fine as long as the creature's abilities average out to a value close to the average for the Target CR. Since monster designers will be building these creatures in the context of D&D 5e discarding the remainders is the most appropriate approach here and I have used that method to construct the table for this section. Prediction: We know that maximum monster ability scores will be 30. My prediction is that we won't commonly see this in monsters until past CR20. I think it'll plateua shortly after that CR out to the CR25 or CR30 maximum I predicted in my last post. Monster Hit Points are one of the most important aspects of D&D 5e monsters, along with the creature's damage output. I believe that these two stats are the principle elements used to determine a creature's Actual CR, but we'll look at that in a later post. During my D&D Next Monster Analysis we saw that there is an important relationship between PC Damage and monster HP. In fact PC Damage Output is the main consideration for determining appropriate monster HP and that is clearly still the case in D&D 5e. In order to analyse monster Damage and Hit Points I had to enter that same data for PC Classes into a spreadsheet and use that data in the analysis of monster stats. This data was presented to the community for review, comment and reuse in this thread on the Wizards of the Coast forums. Graphing the sum and average of PC Damage reveals some interesting patterns. At levels 5, 11 and 17 PCs see a significant gain in damage output - a jump of about 5 damage on top of their normal progression. In other words they double the damage gain they normally make over an entire tier of play. This kind of "stepping" is often used in game design to help build a feeling that characters make significant gains in power by advancing into new tiers of play. Wizards of the Coast has used this before and even told us this would be the case at these levels in recent Legends & Lore posts and on Twitter. Wizards of the Coast didn't tell us about the flatter damage gain in the final tier and it's final damage step at level 20. But this is hardly surprising since PCs typically take on Deities and Greater Demon Lords at this point in the game. Interestingly this also lends some support to the idea that creatures higher than CR20 will be part of the game. I've read a number of comments on the net about folks finding 5e monsters difficult to figure out. 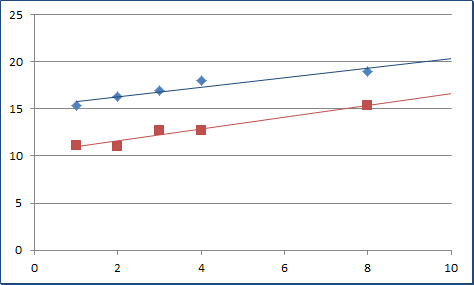 They often point to power curves like those in D&D 4e and talk about how predictable and incremental these are. Folks seem to find the stepping in 5e problematic because they can't look to the underlying curve. The thing is, even if Wizards of the Coast are simply cobbling all of 5e together in a huge spreadsheet without using coherent formulae and curves... Why curves will still tend to be there! And this is no exception. If we take the average PC damage output from our first graph we can plot a simple Power trendline over it. We can angle this trendline so that much of the regular damage progression in each tier aligns with the trendline. The dip before the step at the end of each tier falls away below this and the steps at levels 5, 11 and 17 (and the one at level 20) pop up to just above the trendline. So how do the Hit Points of monsters from the Starter Set (and Horde of the Dragon Queen) relate to PC Damage? Well what I did was compare those with the actual PC stats at the same level as the CR in question. For monsters with a CR under CR1 there needed to be a slight manual workaround in the comparison - to gain the base equivalent PC Damage I had to determine it from the level 1 PC data. To be honest things break down a little bit below CR1 anyway. For example, what's the difference between a CR⅛ and a CR0 creature's hitpoints? We are talking about the difference between say 2hp and 4hp. Most PCs can kill either with a single hit. They differentiate more when we introduce Damage into the equation, but we'll leave that for it's own post. If we divide the average monster HP by the average PC Damage for the same level/CR we see that it is consistently a 5. What does this mean? Well a party of 4 PCs shaping up against a monster of the same CR as their level can expect that opponent to survive for about two rounds, on average. We could assume that the halfway point between each of these values is the cut-off point for each CR, but that isn't the case. There appears to be some overlap between adjacent CRs. This is mainly constrained within a 5% overlap, however the Hit Points of some monsters is significantly above or below these limits. In most of these cases there is a corresponding opposite variation in Damage and the remainder of the cases compensate in some other manner. This supports the supposition that Damage is a significant factor when it comes to assessing Actual CR. As we can see this pretty much the traditional pre-D&D 4e method for determining monster HP. The fiddly part here is determining the appropriate HD for a monster based on it's Target HD, incorporating the creature's Constitution modifier into the equation. To help facilitate this I spent a couple of hours precalculating a table of the number of a given HD needed to achieve close to a given Target CR's target Hit Points, assuming the creature has a constitution of average for that Target CR. Hopefully this helps put folks in the right ballpark when building monsters for a given Target CR. But in many cases readers will find that they still need to tinker a bit with number of HD and the creature's Constitution score. In these cases modifying number of HD generally results in the smallest incremental changes, while changes to Constitution normally result in bigger differences. So how do the monsters in the Starter Set and in Appendix B of Horde Of The Dragon Queen fit these tables? Between the Starter Set and Appendix B of Horde Of The Dragon Queen there are 33 creatures. 15 of these 33 have HP outside the boundaries I described. 8 of these 15 could be have inappropriate hitpoints after factoring in their Damage, using my provisional method. 4 of these 8 are more than 3 hitpoints outside the ranges we have discussed. I consider 3 or less to be an acceptable margin of error in this area. So these 4 creatures could be considered "outside CR", but is this the case? Flameskull This creature falls well short of minimum target HP. Looking at the Flameskull we can see that it has considerable resistances and immunities, possibly more than other creatures of this CR will have. But the real trick here seems like the Rejuvenation trait. PCs will probably have to fight this creature twice to beat it! So we can consider it valid. Additionally I did not include Damage from it's Spellcasting trait and this should probably compensate it's HP a modest amount. Langdedrosa Cyanwrath This creature from Horde of the Dragon Queen seems to fall a bit short on both HP and Damage. But if we look closely at it we can see that it has quite high Alpha Damage. I suspect that this has been factored in as approximately 7 or more in their base Damage, which would see them within an appropriate Actual CR. Spectator While the Spectator's HP are below the minimum for it's CR that's not why it falls below CR. Instead this comes back to difficulties accurately determining the creature's Damage output. Only one of the Spectator's four eye attacks cause damage and so only that eye's damage has been calculated. If we assume that the it's Spell Reflection and the effect of another eye combined would be "worth" at least 12 damage we find that it falls neatly within it's CR. Zombie The Zombie's HP are much more than we'd expect for a CR¼ creature, in fact they are more in line with a CR1 monster. On the flip-side it's Damage is more appropriate to a CR⅛ or even a CR0 monster. Combined with it's slow movement I think the Zombie is probably OK. As I've inferred before, the tighter margins below CR1 allow for less leeway with creatures that push the boundaries of our definitions. Prediction: Once the Monster Manual has been released I believe we'll see that creature Hit Points will vary outside their suggested boundaries more frequently than their Damage does. As I said in my last post the Pyromance will be a ranged glass cannon with a focus on Arcane fire. I'm loosely modelling it on the Wizard class, so I will focus on Intelligence as it's main stat. To compensate I will give it below average Strength, because of all those years studying dusty tomes. The Pyromancer's Dexterity will be slightly above average - he looks after his fingers and practices a lot of arcane gestures and exercises. The remaining stats I will leave at average for a CR5 creature. This monster is going to rely on cover and it's allies to protect it, rather than high defences and an ocean of health. So I am going to set it's Hit Points below the minimum suggested for a CR5 creature. This will allow me to push it's Damage up quite high for it's Actual CR. Tweaking number of HD and not adjusting the creature's Constitution score is the easiest way to do this fine tuning.